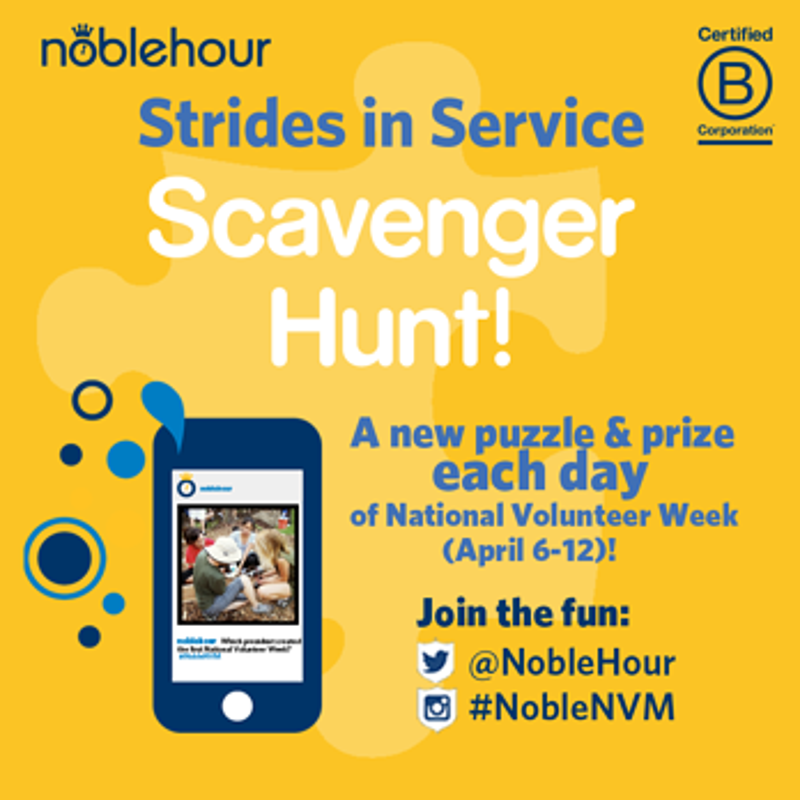 In celebration of National Volunteer Month, NobleHour is launching a virtual scavenger hunt to inspire participants to serve. On each day of National Volunteer Week, April 6-12, NobleHour will use Instagram and Twitter to share clues or questions related to volunteering and community engagement. Participants that Tweet the correct answer to @noblehour with the hashtag #NobleNVM will be entered to win daily prizes and the grand prize of an iPad Mini. In addition to hosting the scavenger hunt, NobleHour will be sharing volunteer tips, exclusive service-learning blog posts, volunteer opportunities, and inspirational service quotes all month long. “We believe in celebrating service every day, but we get especially excited for National Volunteer Month,” said Keara Ziegerer, NobleHour’s User Engagement Manager. Members of the NobleHour team will also connect with volunteers at the 2014 National Service-Learning Conference, MONUMENTAL. The conference runs from April 9-12, ending with Global Youth Service Day – the largest service event in the world. For more information about the Strides in Service Scavenger Hunt and NobleHour’s National Volunteer Month celebration, visit info.noblehour.com/nvm. For the past quarter century, the National Youth Leadership Council has brought together youth and adults from all over the world and all different disciplines to share ideas, skills, passions, and their service-learning experiences at the National Service-Learning Conference. The yearly conferences are held in various host cities, with different co-host organizations, and continues to grow in participant number as well as prestige of keynote speaker and program leaders every year. This years 25th annual MONUMENTAL conference April 9th to 12th will prove to be one of the biggest and most exciting yet. The conference will be held for the first time in Washington D.C., a city whose international network and incredible civic engagement has been a major motivation for this year’s MONUMENTAL theme. The conference will take full advantage of the unique service, programming, and networking opportunities our nation’s capitol has to offer. All conference workshops and plenary sessions will take place at the historic Washington Marriott Wardman park, unless otherwise indicated in the posted schedule. Various keynote speakers include Sandra Day O’Connor, retired Supreme Court Justice, Arne Duncan, ninth U.S. Secretary of Education, and Minh Dang, White House Champion of Change as a national leader and in human trafficking and child abuse. Youth leaders in service are equally involved in the preparation and participation as their adult counterparts and the conference will spotlight some of the most inspirational, motivated, and change-making young people as featured speakers, program organizers, and session leaders. Highlighted conference events include Capitol Hill Day, a truly unique opportunity for adult and student leaders to advocate for youth as solutions to today’s toughest challenges at home and abroad by meeting with legislators and Congress members. The goal of NYLC and Capitol Hill Day is to convene hundreds of youth advocates, as well as provide them the support and opportunity to meet with Congressional offices, to educate policy-makers about the importance of collaborating with young people to incite real change in their communities. Another highlighted event of this year’s conference is the Day of Service: A Celebration of Global Youth Service Day (GYSD) on Saturday April 12th. All attendees are encouraged to give back to the D.C. community and put into practice some of the service learning skills and initiatives they have just learned about in the days prior at the NSLC. The Day of Service will be held on the National Mall near the Lincoln Memorial steps and includes several different ways to become engaged and have fun, including direct service projects, networking with community members and local nonprofits, and opportunities to hear from community leaders. Partnering organizations such as the Peace Corps, D.C. Habitat for Humanity, Earth Force, generationOn, and Special Olympics Project UNIFY will be present to hone the energy and inspiration cultivated by all conference attendees, speakers, and leaders. Youth Service America (YSA) is the founder and chief organizer of GYSD, the largest service event in the world and the only day of service dedicated to children and youth, which is held each year over a weekend in April (April 11th to 13th for 2014) in more than 100 countries on six continents. As the conference’s co-host, YSA aims to bring this monumental and international service event to the 2014 MONUMENTAL NSLC and Washington D.C. in order to address environmental issues, health and inclusion needs, and educational disconnects of the surrounding community. GYSD is both a celebration and mobilization of service-oriented youth, sharing the same focus and motivation as the annual National Service Learning Conference. Whether you are a returning conference attendee or newcomer, young person or adult, student or teacher, administrator or non-profit organization, researcher or consultant on service learning and youth leadership, the NSLC’s multiple day and concurrent program schedule enables any type of attendee to personalize their conference and design experiences tailored to their own needs and passions. The educational sessions, discussion groups, interactive workshops, and featured speakers will provide both youth and adults the tools, resources, ideas, and motivation to enhance their service learning practices as well as improve their school, organization, and community. With the wide variety of program topics and types, anyone can become engaged in and inspired by the NSLC. NobleHour is pleased to again be a sponsor of this year’s National Service Learning Conference. And we are excited to present an interactive discussion-based workshop on how to use service learning to empower students to become Changemakers will certainly prove beneficial for coordinators, teachers, and students to increase their understanding and value of applying what is learned in the classroom to the community. We will focus on how to effectively implement service learning projects with high school and college students to teach Social Entrepreneurship, Civic Engagement, and Student Leadership. Through group discussion and interactive presentation, we plan to facilitate the sharing of service learning experiences among participants. We hope to share our expertise and experience with the audience and together discuss effective strategies to increase students’ engagement, and enhance their learning, in the classroom and beyond. You don’t want to miss this year’s National Service Learning Conference in Washington D.C. or the Global Youth Service Day taking place all over the world. 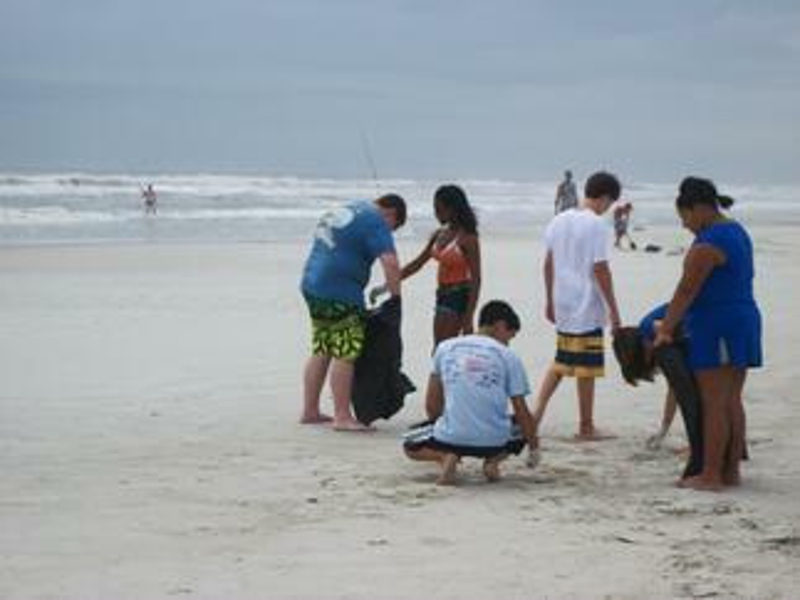 Find out how to get involved with one of the hundreds of projects or if GYSD is already coming to a region near you. Even if you cannot attend this year’s exciting conference, there are many ways to stay connected and informed of the NSLC’s happenings through facebook, twitter, or the soon to be available NSLC mobile app.